A "flow through system" refers to the free flow of water through the unit from the normal water pressure. By contrast, a reverse osmosis system slows down the flow of water and generates two streams - pure water to collect and consume, and flush water to discard or use only for work tasks like washing the car. With reverse osmosis the collection of pure water is much slower than with a flow-through filter unit, but the RO water will be more thoroughly cleaned. Our flow through filter systems are centered around a multi-stage filter cartridge with six stages (seven stages for fluoride removal). This cartridge includes both redox media and carbon. 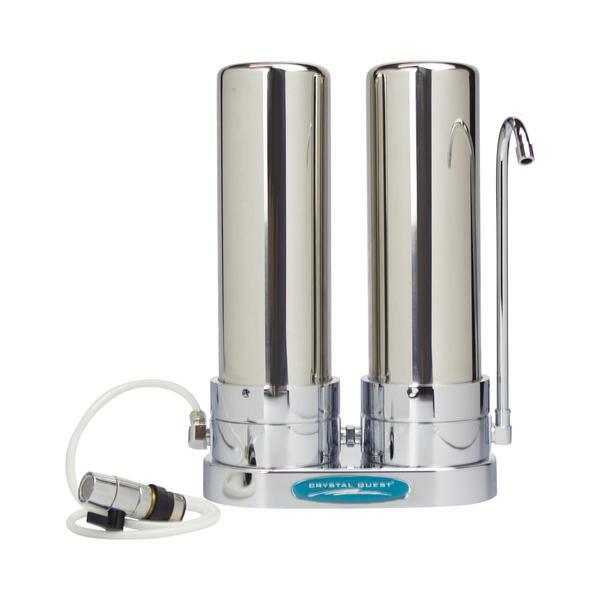 Many of today's water filter systems include redox media, a unique alloy of copper and zinc that performs many beneficial functions. Redox eliminates toxic chlorine, removes heavy metals and destroys bacteria, algae and many parasites that might be in water. 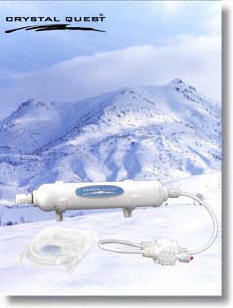 Most importantly, redox protect the carbon commonly used in water filters for decades. If chlorine is taken care of before it reaches the carbon, the carbon will have a much longer functional life and do a better job of removing the organic chemicals and other contaminants. Redox and carbon working together also take care of problems with odor, poor taste, THM's, PCB's, dioxin, nitrates and thousands of other organic chemicals and inorganic poisons, for an extended time, at the minimal cost of approximately a few cents per gallon! 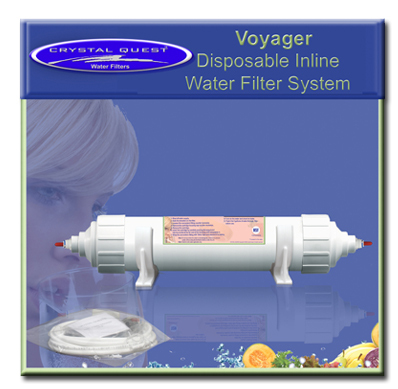 Our multi-stage filters also contain two 1 micron filters. 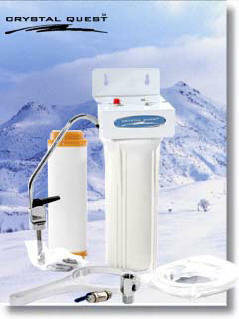 Filtering to a micron or less removes parasites and many bacteria which may be present in water. Most of these that survive the chlorine added by cities, are killed by the redox, but it is still desirable to remove them if possible. 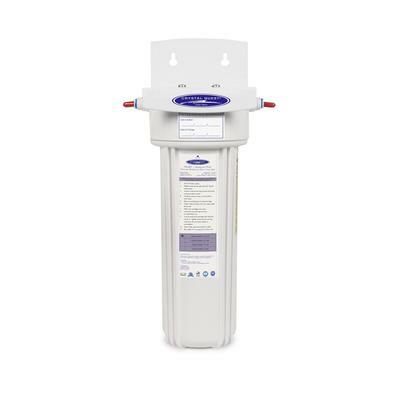 For cost conscious individuals who prefer the convenience of the minimal delay in drawing water with a full stream, our flow through water filter systems provide a high quality of consumable water. 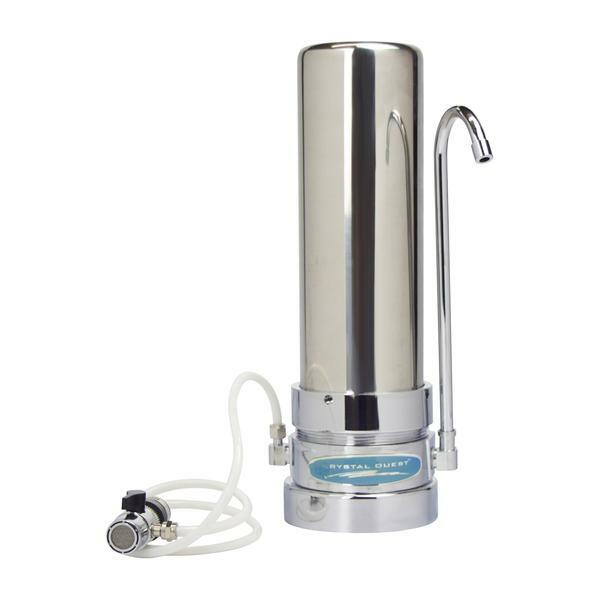 Faucet Mount Water Filter -- Enjoy delicious, healthy water with an advanced water filtration system for healthier, great-tasting water, right from your tap. About 2.5 in. diameter. The only leading faucet filter with 5 stages of filtration: 1 micron pre-filter, Granular Activated Carbon (GAC), ERA-6500, ERA-9500, ion exchange resin, 1 micron post filter. 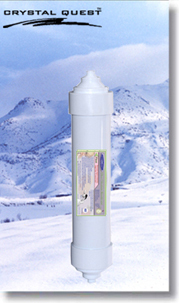 Mini Counter Top Travel / Camping Water Purifier (11 in. by 2 1/2 in.) -- 6 stages of filtration: 1 micron pre-filter, Redox ERA-6500, Redox ERA-9500, ion exchange resin, GAC (carbon) and 1 micron post-filter. 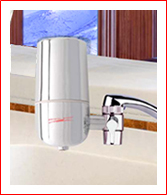 Includes stainless steel diverter valve & inlet hose, plus stainless steel spout. 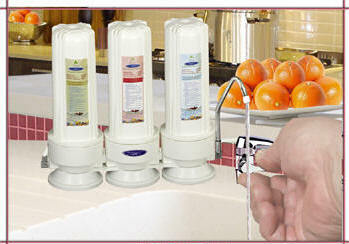 Single "Smart" Multi 6-Stage Counter Top Flow Through Water Purifying System -- Standard housing about 5.25 in. wide including spout; "Smart" multi 6-stage filter cartridge: 1 micron pre-filter, ERA-6500, ERA-9500, Granular Activated Carbon (GAC), ion exchange resin, ion exchange resin, 1 micron post filter. For city water that is NOT fluoridated. Capacity: 8,000 + gallons -- change every 1 to 2 years (depending on sediment). Includes stainless steel diverter valve & inlet hose, plus stainless steel spout attached to housing. 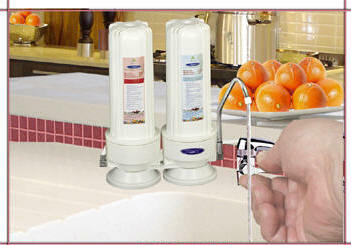 Dual Counter Top Flow Through Water Purifying System -- Two standard size housings, about 10 in. 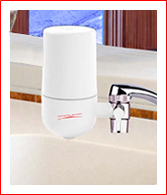 wide including spout, containing: 7 stages of filtration: solid carbon block (1st housing) (change every 1 to 1 1/2 years); "Smart" multi 6-stage filter cartridge (2nd housing) (change every 1 to 2 years): 1 micron pre-filter, ERA-6500, ERA-9500, Granular Activated Carbon (GAC), ion exchange resin, ion exchange resin, 1 micron post filter. 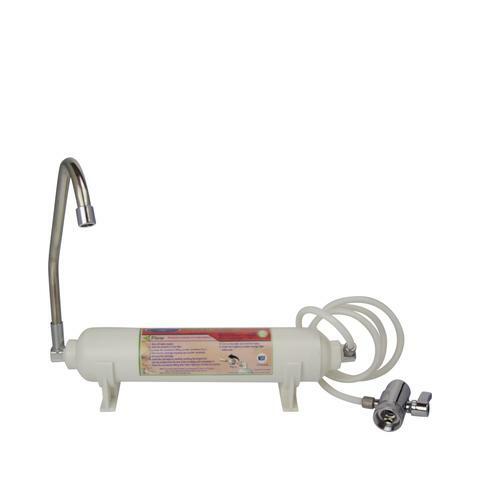 Sediment Triple Counter Top Flow Through Water Purifying System for Water with Sediment (well water typically has more sediment) -- Three standard size housings, about 14.5 in. 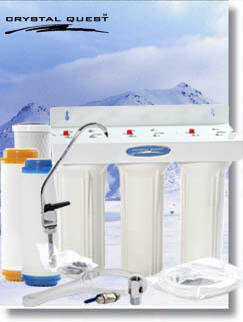 wide including spout, containing: 8 stages of filtration: 5 micron reusable sediment filter (1st housing) (clean periodically with sterile brush - change as needed); "Smart" multi 6-stage filter cartridge (2nd housing) (change every 1 to 2 years): 1 micron pre filter, ERA-6500, ERA-9500, ion exchange resin, Granular Activated Carbon (GAC), 1 micron post filter; solid carbon block (3rd housing) (change every 1 to 1 1/2 years). For high sediment city or or uncontaminated well water. Capacity: 6,000 to 8,000 + gallons. Includes stainless steel diverter valve & inlet hose, plus stainless steel spout attached to 3rd housing. 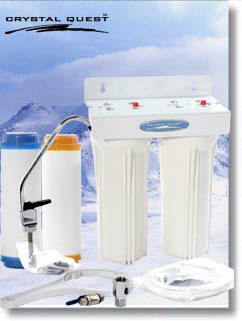 UltraFiltration Triple Counter Top Flow Through Water Purifying System -- Three standard size housings, about 14.5 in. 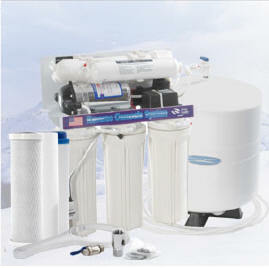 wide including spout, containing: 8 stages of filtration: solid carbon block (1st housing) (change every 1 to 1 1/2 years); UltraFiltration membrane (2nd housing) (change every 2 to 2 1/2 years - more often with well water); "Smart" multi 6-stage filter cartridge (3rd housing) (change every 1 to 2 years): 1 micron pre-filter, ERA-6500, ERA-9500, Granular Activated Carbon (GAC), ion exchange resin, 1 micron post filter. 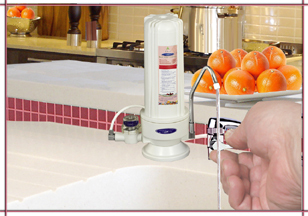 Single "Smart" Fluoride Removal Counter Top Flow Through Water Purifying System -- Standard housing about 5.25 in. 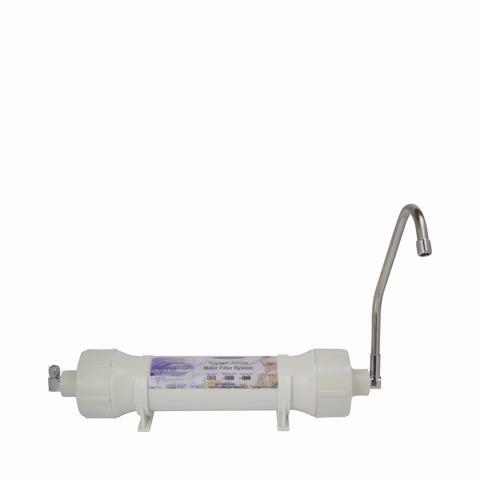 wide including spout; 7 stages of filtration: "Smart" multi 7-stage filter cartridge: 1 micron pre filter, special fluoride removal media*, ERA-6500, ERA-9500, Granular Activated Carbon (GAC), ion exchange resin, 1 micron post filter.